I am writing from Huaras, Peru. Today I rode a mountain bike up to 13,000 feet and then hiked through the hills visting Pre-Inca ruins with an archeologist. Then Michael Nad and I rode extra to a bouldering spot on a stream. The white-capped peaks are in the backdrop and are the most spectacular mountains I have ever seen! We bouldered for a couple of hours. I have walked among many Peruvians wearing there traditional clothes and herding their sheep along. The food is different than Mexico or Colombia. I am staying at a hostel that caters to climbers and trekkers. It has this internet computer. I am getting to use my spanish skills again and it is fun. Tomorrow we are hiking up to a lake below a peak named "Churup". This is part of the acclimation process. In two more days I should be at 15,000 feet and then upward from there. We do a lot of walking to get around this mountain town, which I like. Hopefully the climbs will go well. 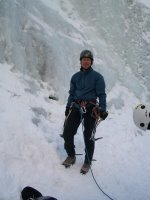 We hope to climb Pisco (18,500 ft) and then Chopicalqui (20, 850 ft) before the end of the trip. This is a 17 days trip. This past week we went on a Trek. Marty and Rebecca went along. Deb, being the stake young women's president, had a major role in planning and carrying it out. I was asked to be the medical support for the 3 days. This is the 3rd time our stake has done this. The last one was done 4 years ago and Angie participated in that one. It took place in the hills above Enterprise Reservoir. 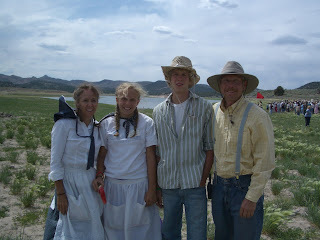 Marty and Rebecca were each assigned to a new family and we all dressed up as pioneers. 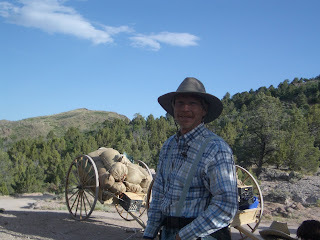 They pushed and pulled their handcarts up and down rough dirt roads for about 18 miles. My truck followed behind as the medical vehicle. I let Deb drive it most of the time as I walked up and down the handcart company. I took Mookie along and he had a blast. He became the company mascot. The weather was good. Hot and dry. 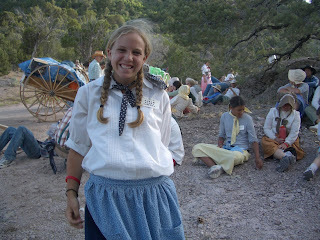 Probably the hardest thing for me was wearing "pioneer clothes" the whole time. The youth slept on the ground. Deb and I slept in the bed of my truck. There were over 160 youth on this trek. They had several good speakers and activities. 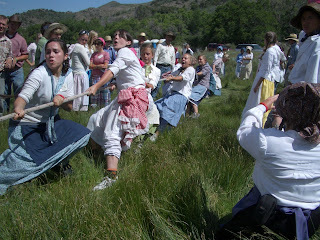 One of the highlights was the tug-o-war with a rope I had purchased last year. I finally got to put it to good use. The testimony meeting afterwards was very good. 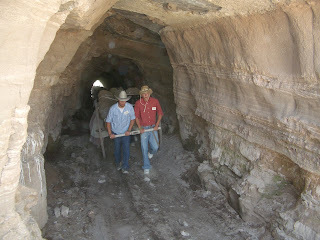 Both Marty and Rebecca were strong members of their "families" and did more than their share at pulling the handcarts. It was a great activity, but nothing I would want to do every month.